When astronomers examine the Milky Way galaxy, they are like the blind people examining the elephant in the old folk tale. Just as each person in the story examined only one part of the elephant, so astronomers must work from limited information. Often arguments about whether the Milky Way has two, three, four or even five major spiral arms depend upon whether one is looking at radio or infrared frequencies, examining cold hydrogen gas or hot young stars, or building models using strict logarithmic spirals or more complex structures. For this reason, the two main data collections on this site, the Milky Way Explorer and the Velocity Explorer, try to combine data from many different sources. For the past few years, I have put a lot of effort into expanding the range of electromagnetic frequencies available through the Milky Way Explorer, from gamma rays and x-rays, visible light, infrared, millimeter waves and radio. Each frequency adds more detail to a complex picture. However, frequency data alone is projected on a two-dimensional sphere, and cannot by itself help us build a full three dimensional map of the Milky Way. For this reason I have added a completely different approach, the Velocity Explorer, which maps the velocity of hydrogen and molecular gas and provides clues to the full three dimensional structure of the galaxy as explained in the section on Velocity. Today I introduced a major new feature to the Velocity Explorer - two new images which overlay velocity data from three recent catalogs of objects that trace spiral structure, including young stars, masers and HII regions. By and large (but not always!) the velocity of these denser objects is consistent with the velocity of the atomic hydrogen and molecular gas. To make a comparison with terrestrial cartography, the gas clouds are the broad continental boundaries, whereas the new velocity data shows star formation regions that are like the major population centres. If we mapped the Earth by only including large cities, we would miss large parts of Canada, Russia and Australia (not to mention the entire continent of Antarctica!). Conversely, if we left out the cities, we would leave out much that is of interest to human beings. You can plunge right into the new overlay images in atomic hydrogen and molecular gas but you will need to read the introduction to the Velocity Explorer and perhaps the whole section on this site on mapping hydrogen gas to get some context. The BeSSeL VLBI maser parallax survey (link and related papers), in yellow. The Perseus arm may not be a single structure, as I discussed in a previous blog post. In this blog post, I discuss the evidence in the RMS data that the outer Perseus arm is actually a branch of the Norma arm and is not connected to the Perseus structure detected in the inner galaxy. The image below is a detail of the overlay illustration from my first RMS blog post. 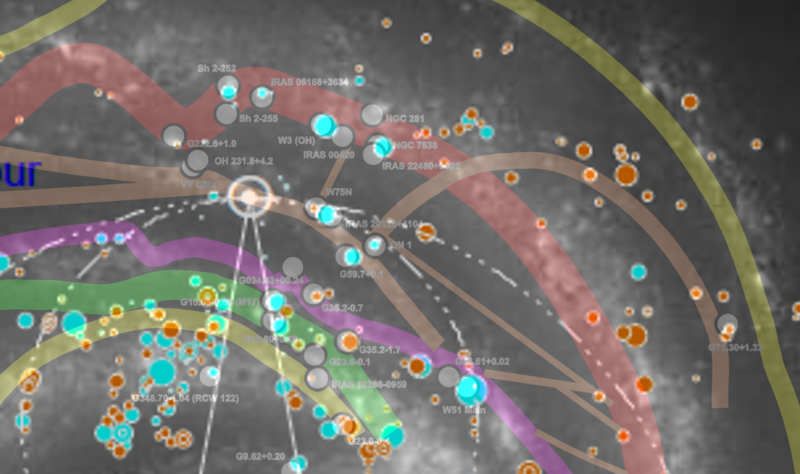 The Milky War model from this site is overlaid by Robert Hurt's Milky Way illustration, which in turn is overlaid by the RMS data. 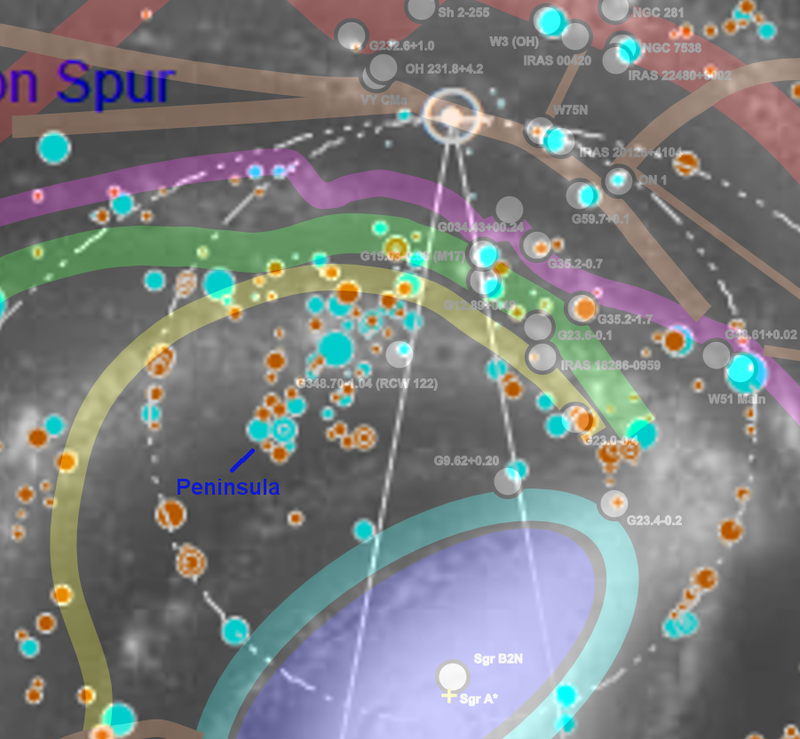 The Perseus arm is in red, the Norma arm is yellow, and various smaller non-spiral structures are shown in orange. The RMS data shows complexes of massive young stellar objects and HII regions (blue circles) and individual objects (red circles). You can view a larger and more detailed version by clicking on the image. In the atomic hydrogen velocity data from the Leiden-Argentine-Bonn survey, there is a prominent structure that appears to lie between the Perseus and Norma arms in the first and second quadrants. I called this structure the Cygnet spur. Instead of considering the Cygnet velocity structure as a spur, it may actually reveal that the outer Perseus arm branches off the Norma arm. The RMS data provides more evidence for this branch. 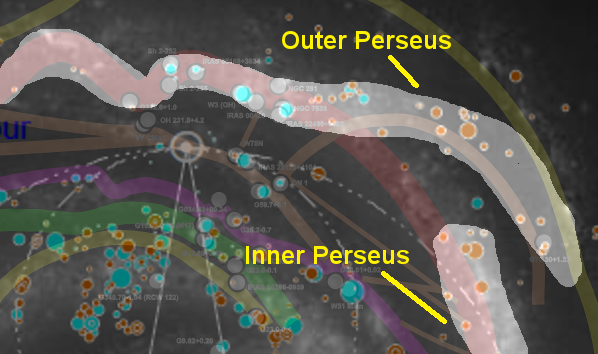 In the image below, I have highlighted the two sections of the Perseus arm. The RMS data shows a clear gap in the Perseus arm between 50° < l < 80°, with only one small source in this region, providing more evidence that this arm may not be a single structure. In contrast, the RMS data shows many large sources connecting the Outer Perseus arm to the Norma arm. This is also consistent with the hydrogen data and provides a better explanation for the hydrogen velocity in this direction than a spur. Simple mathematical patterns are seductive. Our brains and in particular, our visual processing systems, are pre-programmed to see them everywhere, even if they do not exist. Disk galaxies are a good example. Hydrogen clouds, star formation regions and dust in disk galaxies often seem concentrated in prominent arms that are typically mathematically modelled using logarithmic spirals. However, a simple mathematical model, while tempting, can be actively misleading. 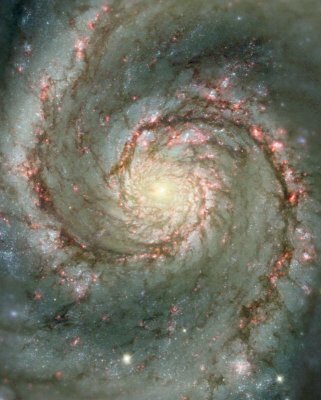 If we carefully examine even grand design spiral galaxies such as the Whirlpool galaxy, Messier 51, shown to the right, we can see deviations from a simple spiral pattern, including shorter non-spiral arms, changes in arm thickness, and small "feathers" that connect the larger arms together. It is often the deviations from a spiral pattern that are the most interesting features of a disk galaxy like the Milky Way. This is why the RMS data discussed in my last two blog posts is so important. By providing distance estimates for HII regions and massive young stellar objects throughout the galaxy and well beyond what has been mapped using parallax alone, the RMS data provides the beginning of a real portrait of our home galaxy, revealing some of the unique features that are distinct from a mere mathematical model. In this blog post I discuss what appears to be one of the most prominent deviations from spiral structure in the Milky Way: a vast structure in the inner galaxy that I've called the Peninsula. I initially suggested the existence of the Peninsula when examining the mystery of RCW 122. RCW 122 is an enormous star formation region in the inner galaxy, especially prominent in images from the Spitzer infrared space telescope. The published radio parallax-based distance estimate of 3380 (-270 / +330) parsecs does not place it near any of the spiral arms or in the 3 kpc arms or bar. When I examined the atomic hydrogen velocity data more closely, I suggested that a "peninsula" of hydrogen gas extended from the Norma arm towards the bar and that RCW 122 was part of this structure. The RMS data suggests that the Peninsula is real and is larger and more prominent than I had imagined. In the rough diagram at the end of my article on RCW 122, I had shown the star formation region at the end of the Peninsula. However, the RMS data suggests that the Peninsula is much larger than I had estimated and RCW 122 is located in about the middle of this vast structure extending from the Norma arm towards the galactic bar. The illustration to the left is a detail of the larger overlay image from my first RMS blog post. The image shows the Milky Way model from this site overlaid by the Hurt illustration, which is overlaid again by the RMS data. The Norma arm is in yellow. The RMS data shows complexes of massive young stellar objects and HII regions (blue circles) and individual objects (red circles). You can view a larger and more detailed version by clicking on the image. As I pointed out in my previous blog post, the Hurt illustration appears to be inaccurate in the fourth quadrant. I discussed the position of the Sagittarius arm in my last blog post. In the overlay illustration both the RMS data and my own Milky Way model suggest that the Norma arm is more substantial and further away from the galactic bar than shown in the Hurt illustration. All of this is not to say that adding the Peninsula to a model of the Milky Way explains the positions of all the known star formation regions. The RMS data shows two twin "islands" made up of many star formation regions that appear to float well beyond the Peninsula between the Norma arm and the bar. More mysteries to explore! Robert Benjamin is one of my favourite astronomers. Best known for his association with the Spitzer infrared space telescope, Benjamin has used the data from this telescope for a number of creative and influential projects. One of these. the gigantic GLIMPSE/MIPSGAL infrared mosaic of the inner galactic plane, helped inspire the Milky Way Explorer, was used for the Milky Way Zooniverse citizen science project, and influenced the even larger Galactic Plane Atlas expected to be released in 2014. Benjamin and his colleagues also commissioned Robert Hurt to create his widely used image of the Milky Way, which has been used in many recent scientific papers, even by researchers who disagree strongly with some of Benjamin's conclusions. The Hurt image was based on available parallax and kinematic data but was created primarily to illustrate the Spitzer scientists' conclusions about the structure of the Milky Way, including the position of the bar and the existence of two major spiral arms. It is therefore ironic that a recent paper used the Hurt image to question one of Benjamin's major conclusions about the Milky Way. Is the Sagittarius arm a major arm? Based on the concentrations of red giant stars observed by the Spitzer infrared space telescope, Benjamin concludes that the Milky Way has only two major spiral arms: the Perseus and Centaurus arms. The Hurt illustration follows this conclusion by showing the Sagittarius and Norma arms as much smaller structures. However, a 2013 preprint described in my previous blog post uses kinematic distance estimates and data from the earlier MSX infrared space telescope to challenge Benjamin's conclusion. The red MSX sources (RMS) researchers overlay their results on the Robert Hurt image in their paper's Figure 6. A detail of this image showing the fourth quadrant is shown to the right. I have added labels showing the position of the Sagittarius and Centaurus arms in Robert Hurt's image. As you can see, the RMS figure shows numerous complexes of massive young stellar objects and HII regions (blue circles) and individual objects (red circles) in the vicinity of the Sagittarius arm - more than can be seen even at the location of the Centaurus arm in Hurt's image. The RMS paper concludes that the Sagittarius arm is also a major arm. But does Hurt's image show the correct locations of the spiral arms in the fourth quadrant? As you can see, there are major differences between my model and the Hurt image in the fourth quadrant. In particular, using my model, the red MSX sources now appear in the Centaurus arm. The Sagittarius arm is largely devoid of young stellar objects and HII regions in the fourth quadrant. More generally there is a greater alignment between these sources and my model than the Hurt image. Although my model was developed completely independently from the RMS research, the alignment is not that surprising because the technique to determine distances used by my model is almost exactly the same as the one used by the RMS paper. Both use the same rotation model for the Milky Way, taken from Reid 2009 as explained here. In the absence of parallax data, both use this rotation model to derive distance estimates for objects identified in atomic hydrogen surveys. My model is based upon the position of large hydrogen clouds in the LAB HI survey. The RMS paper uses the more detailed VLA Galactic Plane Survey and the Southern Galactic Plane Survey results where available. The Reid 2009 rotation model was recently confirmed by the Reid and Honma 2013 paper I blogged about previously. So in summary, Robert Benjamin was right because he was wrong. Benjamin was right in concluding that the Sagittarius arm is a minor arm with only a few major star formation regions. The RMS paper appears to have concluded otherwise because of inaccuracies in the Hurt image commissioned by Benjamin and his colleagues. This raises an interesting question: why is the Hurt image inaccurate in the fourth quadrant? I do not know the sources used to construct the Hurt image. (I've written to Robert Benjamin to ask about that.) However, I think that it is a good assumption that the image in the fourth quadrant used kinematic distance estimates based on velocity data from atomic hydrogen or molecular cloud surveys. This is because almost no parallax measurements for fourth quadrant objects at large distances from the sun have been published and photometric estimates are unlikely because of the large distances and heavy dust obscuration. One of the important pieces of information available from velocity surveys is the tangents of spiral structures. This is the galactic longitude at which these structures first become visible. The tangent value depends upon the temperature of the detected gas. If we use 70K, then the Sagittarius arm first appears in the fourth quadrant LAB HI survey around 281°, the Centaurus arm around 288° and the Norma arm around 312.5°. This information can be viewed in the Velocity Explorer; for example, here. For simplicity, I've shown the combined LAB HI data from the Velocity Explorer fourth quadrant at the end of this blog post with tabs that highlight the velocity associated with the Sagittarius, Centaurus and Norma arms. It appears that the Hurt image places the tangent of the Sagittarius arm around 288° and the tangent for the Centaurus arm at around 312°. As a result, the Hurt image appears to assign the tangent my model uses for the Centaurus arm to the Sagittarius arm, and the tangent my model uses for the Norma arm to the Centaurus arm. The Hurt image makes the fourth quadrant Norma arm a minor structure running close to the galactic bar, something I would argue is incompatible with the velocity data. In fact, as I'll discuss in a future blog post, both hydrogen and RMS data suggest that the Norma arm is much more substantial than the Sagittarius arm and perhaps could be ranked with the Perseus and Centaurus arms as a major Milky Way structure. There are many other interesting features visible in the RMS data, some of which I'll discuss in my next blog post. After I posted my two part blog series comparing the latest parallax-based distance estimates with my model of the Milky Way for the inner galaxy and the Perseus arm, Winchell Chung drew my attention to news coverage of an Urquhart, Figura et.al. arXiv preprint analysing red MSX sources (RMS) - HII regions and massive young stellar objects visible in the MSX infrared survey. most of the distances were estimated from kinematic and spectrophotometric data rather than using the more reliable parallax method. As the RMS paper points out, parallax-based estimates are not possible for most of the galaxy because the data is not yet available. I have taken the RMS/Hurt image from the paper (Figure 6) and overlaid it on my model. The colours in figure 6 are inverted in this illustration, and hence in this version, complexes of HII regions and massive young stellars objects are represented by blue circles and individual sources by red circles. A larger 2324x2168 version of this image is available here. There are many interesting features about this image. I'll highlight some in the fourth quadrant in my next blog post.